The holiday shopping season is in full swing, and retailers are already enjoying a record-setting shopping year thanks to big bucks spent during Thanksgiving sales. But consumers are hardly done shopping. 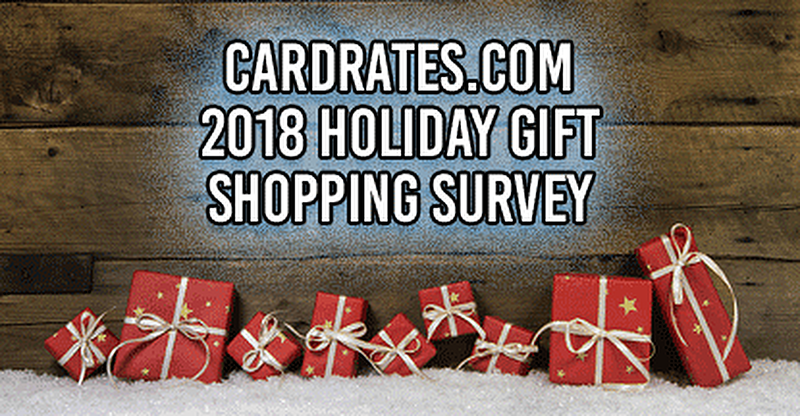 In fact, according to CardRates.com’s 2018 Holiday Gift Shopping Survey, nearly 80% of shoppers still have to purchase at least some of their gifts — and 1 in 4 consumers said they still have to do all of their holiday gift buying in December. With so much shopping still to come in December, we wanted to know how consumers planned to pay for their remaining holiday purchases. As it turns out, nearly half (46%) of holiday shoppers who plan to purchase gifts in December reported they will primarily use a credit card at checkout, and 61% will use a credit card for at least some of their purchases. While credit cards have surpassed cash as the preferred method of payment this holiday season, they don’t have the lead by much; 38% of December shoppers reported they will use cash to buy gifts. Third-party payments services, like Paypal, will only be used by 5% of shoppers, while as many as 2% of shoppers said they will use cryptocurrency. 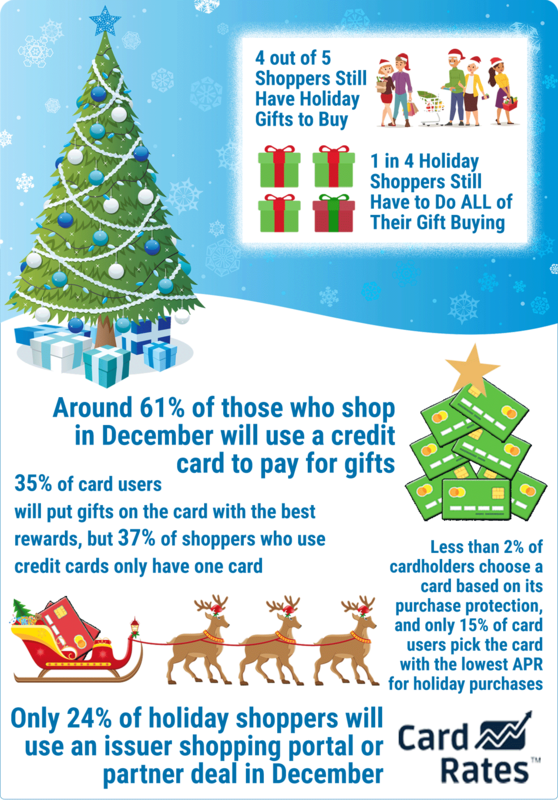 Of those consumers who will use a credit card, 1 in 5 said they will put all of their holiday purchases on a credit card, while more than 50% of shoppers plan to use a credit card for at least half of their gift buying. Many holiday shoppers are looking to earn credit card rewards this season, with 35% of cardholders saying they’ll use the card with the best rewards for their purchases. Surprisingly, less than 2% of cardholders will choose a card based on its purchase protection, while 37% said they only had one credit card. And, despite the efforts of credit card issuers to ramp up their shopping portal experiences, less than 25% of December shoppers will use an issuer shopping portal or partner deal to save on gifts. Of those cardholders who take advantage of shopping portals, only around one-third will use portals for every purchase. We asked our respondents a total of nine questions in our survey, querying more than 500 website users of all genders between the ages of 18 and 75. While some of the results were expected — who doesn’t put off at least some of their holiday shopping until December? — many more were surprising even to our veteran credit experts. Take a look at the full data breakdown for an in-depth look at how consumers are buying gifts this December. 1. What percentage of your holiday gift shopping will you do in December? As it turned out, most people apparently put off all of their holiday gift shopping until December. Nearly 60% of people said they need to do at least half of their holiday gift shopping in December. What may be more startling, however, is that more than 1 in 5 shoppers said they had no more shopping to do at all — talk about early birds. 2. What is the primary way you’ll pay for holiday gift purchases in December? Credit cards were the big winner here, with 37% of all respondents and nearly half of December shoppers saying they’ll primarily use credit cards for buying gifts. Some of the more interesting results showed that 3% of shoppers plan to use a check this season, while nearly as many — around 2% — will use cryptocurrency. Meanwhile, paper currency is holding steady as a favorite payment method, with 38% of December shoppers relying on good-old-fashioned cash. 3. What percentage of your holiday shopping purchases will you make with a credit card this December? While the majority of holiday shoppers said they will use a credit card for at least some portion of their gift purchases in December, 1 in 5 cardholders will put 100% of their purchases on a card. 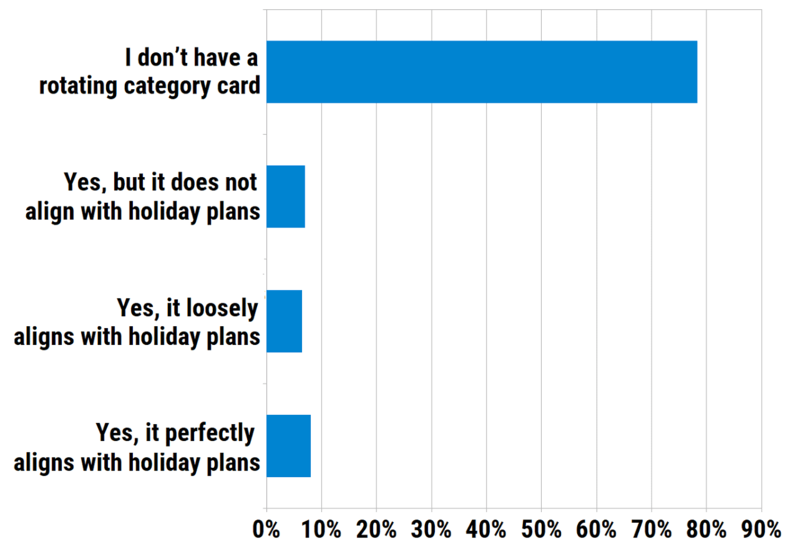 Almost 70% of cardholders said they plan to use a credit card for at least half of their holiday shopping. 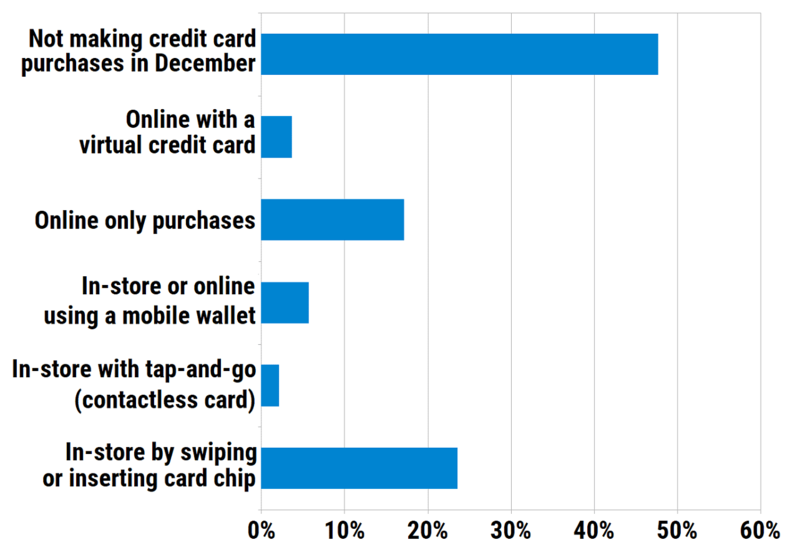 Only 4% of December shoppers who use credit cards will reserve them solely for large or expensive purchases. 4. 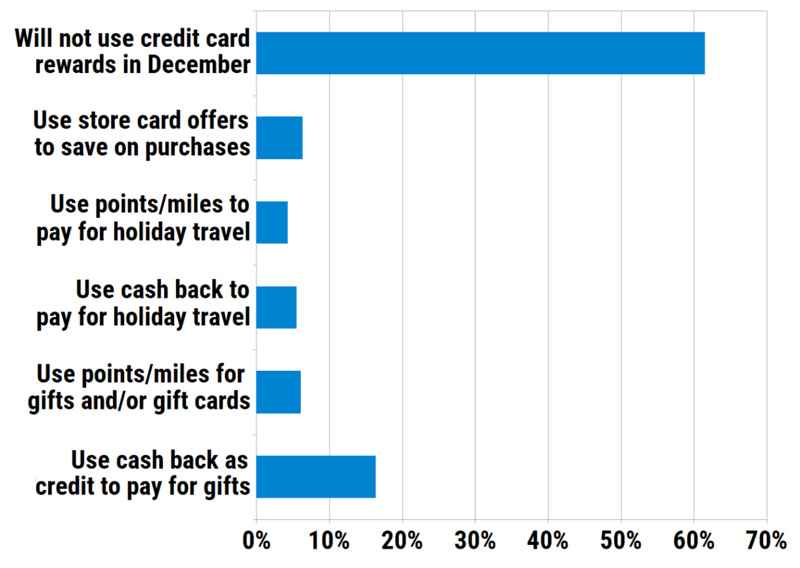 Which type of credit card do you use most often for holiday gift purchases? Purchase rewards are a popular incentive to use credit cards this season, with 35% of cardholders saying they pick the card with the best rewards for their holiday purchases, but only 3% were actively working toward a signup bonus. There were a number of surprises in the responses to this question, including the fact that a full 37% of cardholders said they only had one credit card. Another interesting result was that fewer than 2% of cardholders choose a card for gift buying based on its purchase protections. 5. Will you use credit card issuer shopping portals or partner deals as part of your holiday shopping? This turned out to be very surprising, as less than 25% of respondents said they would use an issuer shopping portal or partner deal this shopping season. 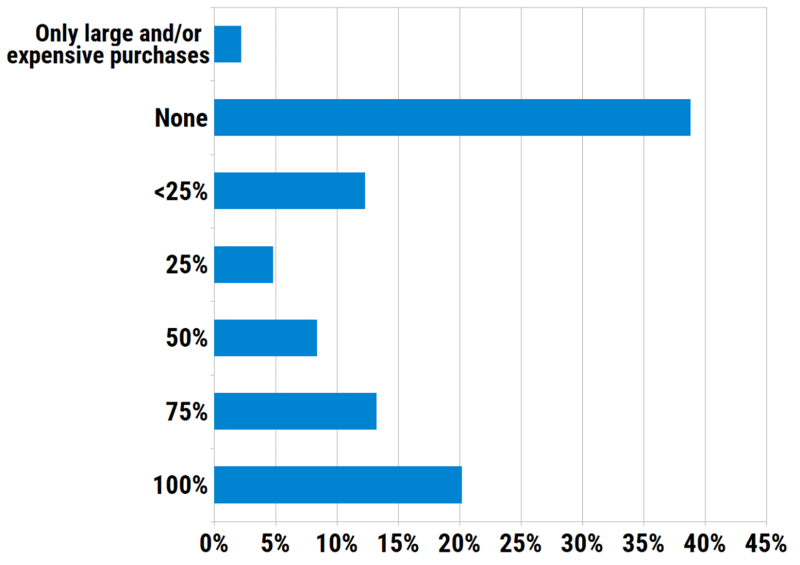 Of those who intend to use a shopping portal or partner deal, only 32% will do so for every purchase. 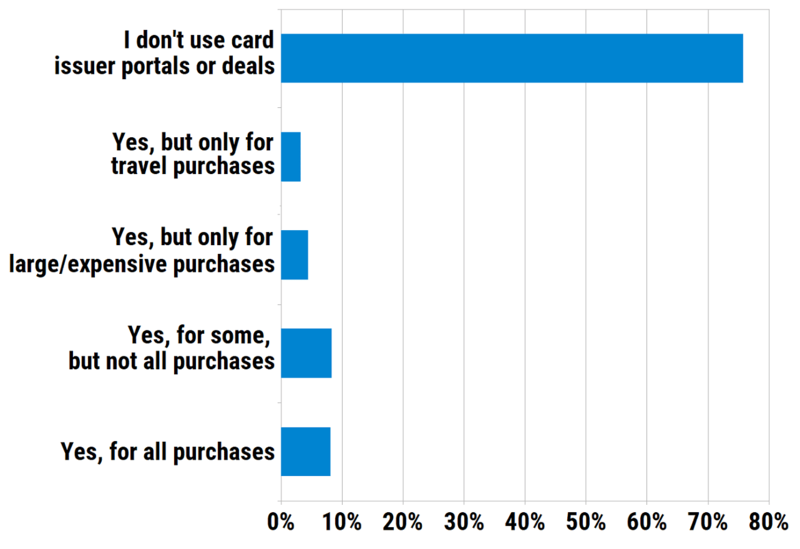 Around 12% will only use shopping portals for holiday travel purchases, while 17% will reserve portals for large or expensive purchases. 6. Do you have a credit card with quarterly rotating rewards categories? If yes, how does the fourth-quarter category align with your holiday shopping plans? Cash back credit cards with bonus categories that rotate every quarter are a popular way to augment a rewards strategy — but that only works if the bonus categories fit your spending habits. For 37% of respondents with rotating category cards, the fourth-quarter category is a perfect fit, according to the survey. At the same time, the fourth-quarter bonus category is a complete bust this year for 32% of cardholders, while the remaining third said the category was loosely aligned. 7. 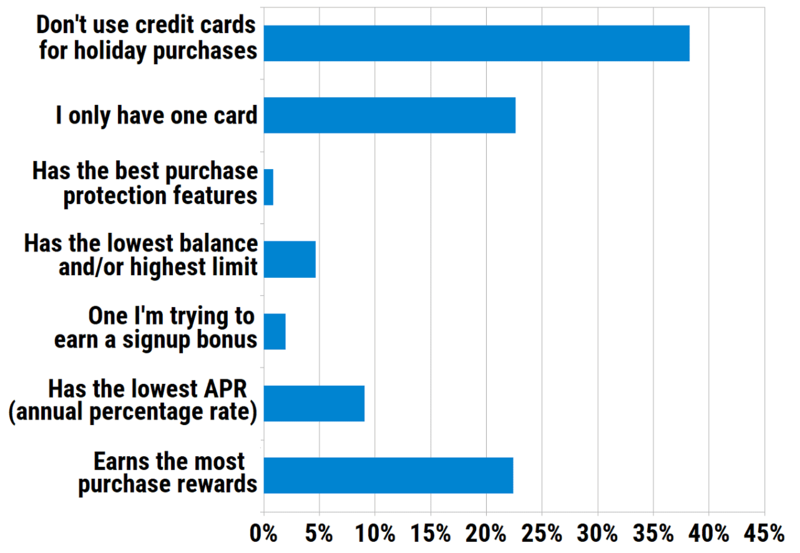 Which type of credit card rewards do you primarily earn? As it turns out, credit card users love to travel, with 1 in 4 saying they primarily earn points and miles that can be turned into free travel like flights and hotel stays. 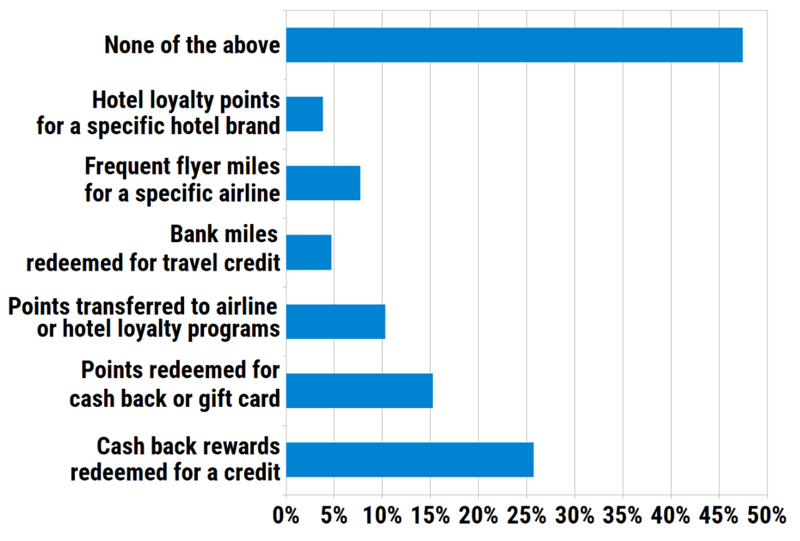 But, while travel is popular, cash is still king, at least among credit card rewards. A total of 41% of respondents said they primarily earn cash back rewards or points that can be redeemed for cash or gift cards. 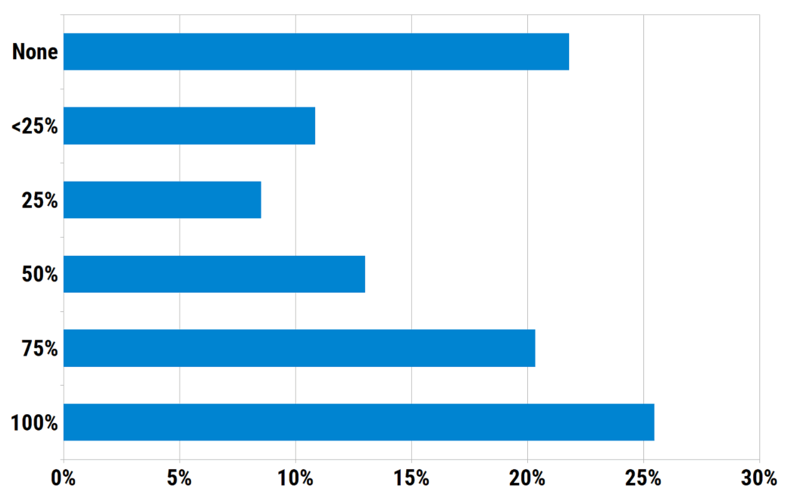 Shockingly, though, almost half of the respondents said they don’t earn any kind of rewards. 8. What is the primary way you’ll use credit card rewards to save on holiday gift purchases in December? In addition to earning rewards on their holiday shopping, consumers are also taking advantage of rewards to save this December. 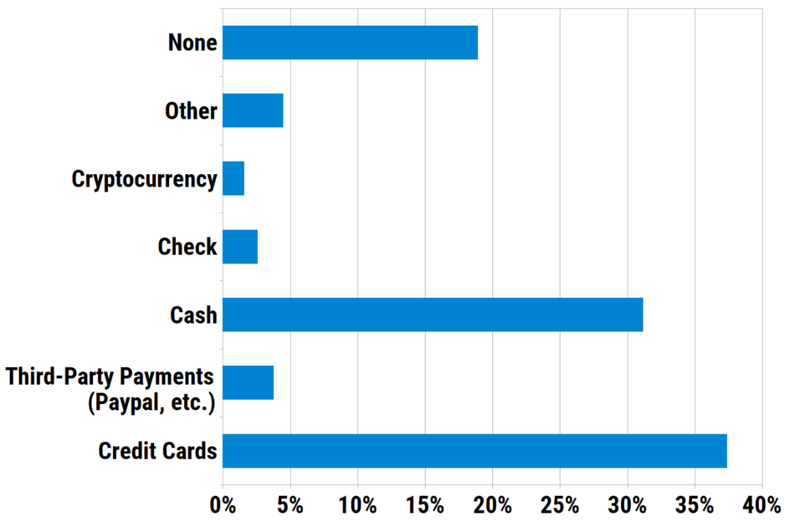 Around 39% of respondents reported they will use credit card rewards of some type, the majority of which will use cash back to pay for gifts. More than 1 in 4 people who will use rewards this December will do so to cover travel expenses, while more than 16% who use rewards will take advantage of store credit card offer to save on their purchases, according to the survey results. 9. How will you use your credit card to make purchases most often in December? Credit card users have more ways than ever to make a card purchase this season, but it seems that most cardholders plan to use their cards in-store at a traditional terminal. Although more cards are coming out with contactless payment technology, cardholders don’t seem to have gotten on board with the new method, as only 4% of card users said they will make a contactless purchase this month. Some cardholders appear to be more cautious, too, as 7% relied on virtual credit cards for online shopping this December. Over the last few years, more and more emphasis has been put on Thanksgiving week sales, with many retailers touting their best deals to usher in the holiday shopping season. But, as our survey found, many shoppers have yet to jump on the bandwagon and are instead saving the bulk of their shopping for December. And when those shoppers hit the stores, most of them will be swiping their credit cards to pay for purchases as they look to earn rewards (and, perhaps, postpone the inevitable holiday shopping bill). Before you head out, of course, don’t forget to check out our list of the best rewards credit cards to help you maximize your earnings on every gift!